A few months ago I came up with this familiar recipe (AKA Chinese fried rice) while trying to figure out what to do with the leftover rice in our refrigerator. 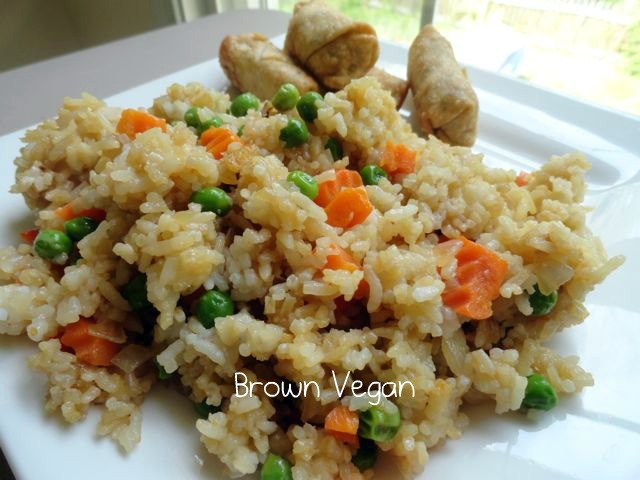 I always use my rice cooker and jasmine rice to make this recipe. I don't think the type of rice you use matters as much as making sure that you use cold rice. I tried it once with warm rice and it came out very mushy. This meal is perfect for a quick weekday dinner. Put vegetable oil in a large pan on medium heat. Add onion and cook for 2 minutes. Break up rice with your hands or fork and add to pan. Increase your heat to medium-high and cook for 4 minutes. Next, add in the peas and carrots. Continue cooking for 2 additional minutes and add soy sauce. What's your favorite 15 minutes of less meal? Let me know in the comments below.